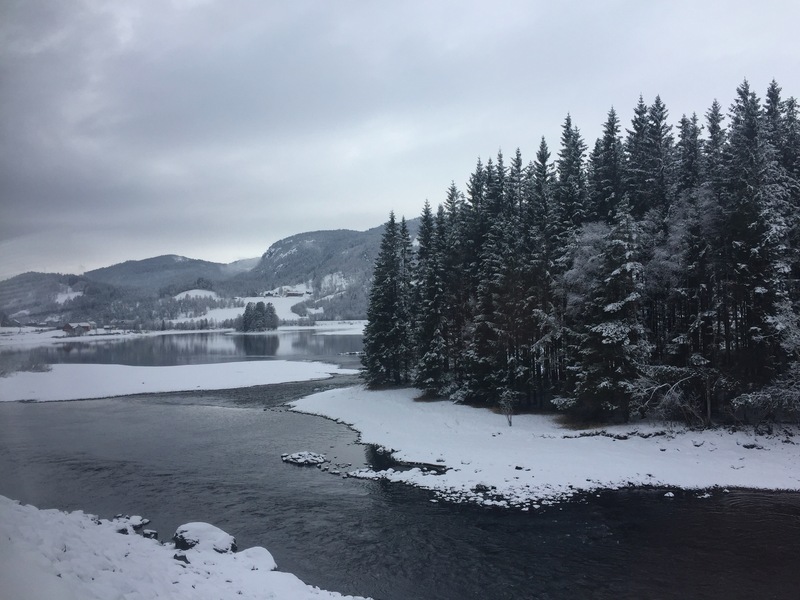 – The Bergen – Oslo Train journey one of the most beautiful train journeys in the world. 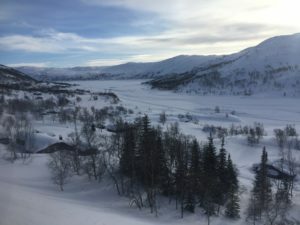 – The 7-hour train ride offers breath-taking views of magnificent mountains, nice forests, lovely lakes, Fjords, cute countryside, villages, mountain houses and cabins. – The train ride can be done across seasons – every season rewards with nice and new views. – The railway is an engineering marvel with hundreds of tunnels, sheds and railway stations in one of the most difficult terrains. – Tunnels play hide and seek. Each tunnel rewards us with an exciting view as the train emerges out. – The Hallingskeid region is the Northern Europe’s largest mountain plateau and the scenery is awesome. – The highest point of the railway is reached in the tunnel at 4058 ft. above sea level. Finse is the highest railway station in Norway. – Scenes of the film Star Wars Episode V: The Empire Strikes Back were shot in Finse. 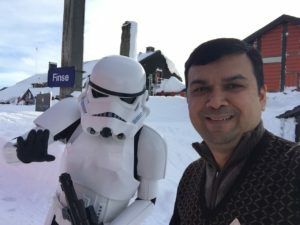 The Star Wars Paratroopers are present in Finse Station. – The signs of civilization thinned as we climbed the ascent. Rivers and lakes got frozen in the snow-filled landscapes. – The shining sun added to the bliss of the train journey. One cannot write enough about the beautiful sights. One has to experience it! You will not regret it! The Bergensbanen is one the most famous and beautiful train journeys in the world. Is it real or another marketing hype? I got the opportunity to check it out this winter. I can conclude with experience that it indeed is a very scenic and mesmerizing train journey. The Bergensbanen (Bergen Railway) has 4 services daily between Bergen and Oslo station each way. My route was from Bergen to Oslo. The train was scheduled to depart at 11:59 am. As I reached the Bergen station at 11:25 am, I could see a few people already waiting to board the train. There were tourists, there were travellers and there were skiers with their equipment. Ski equipment is free to carry in Norway. I saw the train attendant move in with a LV bag and LV purse. The authorities opened the platform only at 11:35 am to board the train – neither too early nor too late. My ticket was in Coach 1 and my friend had been kind to book the ticket in advance. The right-hand side window ticket was booked for me – because it would offer the best views. You can never go wrong with local advice. The NSB Comfort class gives you free Wi-Fi, free unlimited coffee, newspaper and more leg room. Not a bad bargain for additional 10 Euros. The train takes about 7 hours and it is less than half the price of a flight ticket. But the views and the experience are priceless! The train travel is environment friendly and very relaxing as well. The train departed the Bergen station exactly at 11:59 am. Within two minutes, there was a long tunnel. It took us to Arna. After that, the network of tunnels continued. In between each tunnel, I would get a glimpse of a magnificent view, but it would pass soon. Each tunnel would bring an anticipation of a new view as the train would emerge out from the dark. The initial hour was a game of hide and seek with tunnels and views. The game was fun! Since there are more tunnels than views, it is best to finish the lunch in this initial one hour. The fellow travellers did the same – they started eating as soon as the train started. Experience matters! The next stop after Arna was Vaksdal and Dale. I saw lot of snow covered mountains and valleys as we reached Dale. The houses and cars were fully laden with snow – it must have snowed heavily in the night. The next stop was Voss. It is a skiing metropolis and was bubbling with activity. One of the oldest hotels in Norway was located by the train station – Fleischer’s Hotel. It was built in 1889 in pure Swiss luxury style and offered a great architectural view today. The ascent of the train started from Bergen to Voss and continued as we reached Myrdal. The views were now becoming breath-taking. Luck was on our side. It was perfect sunny day. The powder white snow laden landscape was shining bright. The pure whiteness offered a beauty of its own. The magnificent mountains, nice forests, frozen lakes, romantic cabins and bright sunshine ensured the most magical views. It was sheer bliss. It was La La Land. It was nature at its best. Nature is beautiful. Nature is magnificent. Nature is charming. Nature is refreshing. Nature is energizing. Then why do we spend time in our mobile screens and closed cubicles creating narrow mindsets and narcissist culture? The snow and powder white cover was making the entire journey beautiful. The snow was looking beautiful in all its versatility and its different hosts – on black mountains, on green trees, on leafless trees, on cars, on house roofs, on roads etc. And the blessing of a shining sun enriched it. Sports lovers were enjoying it. I was enjoying these views. I had taken the beautiful train ride in Switzerland and have explore a similar landscape of mountains, rivers, forest, cabins etc. The Swiss experience was green experience and it had its beauty – it’s still green in my memory. But this Bergensbanen experience was snow white and it gave me a new happiness. I am glad I did this train ride in winter to get these views. Actually, the ride through the high mountains and valleys would be equally beautiful in summer, autumn and spring as well. Nature is beautiful in all its different seasons. As the altitudes rose, the temperatures started dipping. The train reached Hallingskeid. The region is the Northern Europe’s largest mountain plateau and the scenery was awesome. We stepped out at the station and enjoyed the fresh air and nice views. The train’s ascent continued, and we reached Finse after crossing the longest tunnel in the Bergen Railway. The highest point of the railway is reached in the tunnel at 4058 ft. above sea level. Finse is the highest railway station in Norway. As we reached the station, we saw the Star Wars paratrooper gang. A few scenes of the film Star Wars Episode V: The Empire Strikes Back were shot in the area. We took photos with the Star Wars team and moved on. The Bergen train line is an achievement of engineering and was a major breakthrough of its time. It was built between 1875 and 1909. It had to clear political and financial challenges. The 308-mile train track has 182 tunnels and was built on one of the most difficult terrains. Today it is a pure joy to travel on this iconic train journey. The journey was filled with tunnels, but each tunnel would reward us with a beautiful view. The train tracks were protected with concrete and wooden sheds to prevent the snow from blocking the tracks. The sheds were beautifully done to act as galleries as well. The beautiful views continued as train crossed Haugastol and Ustaoset. I could see lot of tourist and skiers on the ground. 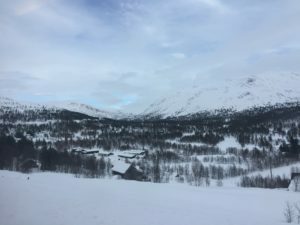 I could also see many cabins and houses – many of them deep in snow. They seemed very difficult to access and I was wondering how would they reach these houses. Often it would be through snow scooters or ski only. The wealthy had their choppers. But choppers did not have Wi-Fi – so drop them! 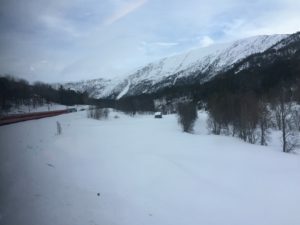 The train reached Geilo after crossing more beautiful views of mountains, fjords, rivers, valleys and villages. After Geilo, the train started its descent into beautiful plains and the views were equally beautiful. There were more forests, rivers and lakes – all beautified with snow. The train’s descent continued, and we crossed Fla. It was getting dark and the sun was no longer visible. But the white snow was everywhere. The views were straight from Frozen or similar Disney movies – cold, white, dense, dark. There were huge lakes that were completely frozen. The forests were getting denser. There was no sign of humanity. Often, we could across a colony of beautiful houses. Its illumination would make it look like an oasis. As the train continued to travel beyond Fla and move towards Oslo via Hokksund and Drammen, signs of civilization started to emerge. The darkness was complete, but snow was omnipresent. During the last 45 minutes, we could see factories, houses, vehicles etc. 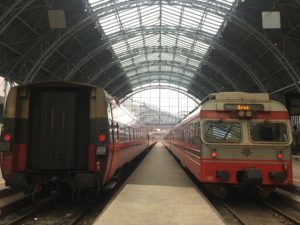 The train finally reached Oslo after exiting one final tunnel in the city. The train reached exactly at 7:03 pm. Thus, ended one of the most relaxing, peaceful, refreshing and memorable train journey. Happiness!